We used to go to Sarasota Florida EVERY SINGLE winter break. We would stay at my Aunt Flo's house (who was my Great Grandfather's sister-in-law). This photo (I believe) was actually taken at my Aunt Jean's house (who was my Great Grandparent's niece? Correct? Mom? Yes?). She also live in (or near) Sarasota. I can't stop looking at this because it looks like my brother and I actually LIKED each other in this photo. Not that we didn't like each other. But... to find a photo where we're both actually smiling and not making some silly face or looking like the world is coming to an end... this is a rare find. And on top of that? We're touching each other and it doesn't involve poking or pinching or hitting. This photo? This would be Christmas card worthy. Well... if it wasn't for my hair. Ignore that. And, um... ignore the bathing suit with the weird t-shirt over it. 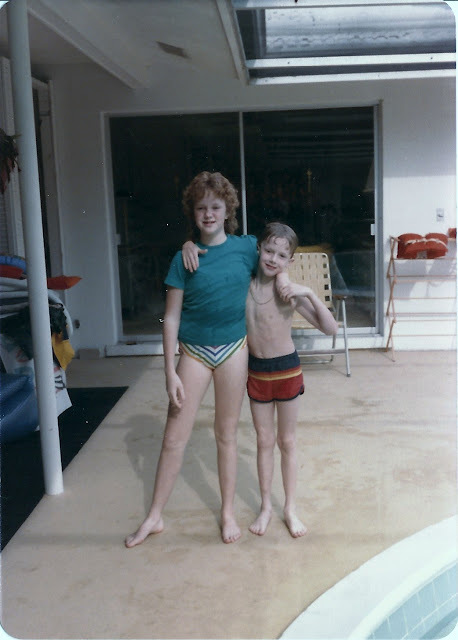 And, oh yeah... don't look at my brother's knobby knees. He'll hate that I posted those.